Are you tired of settling for uninformed salespeople, poor customer service, and insufficient product information in your quest to find the best available price? You don’t have to settle anymore. Our exclusive 110% Guaranteed Price Match ensures you the lowest delivered price with the highest standards of professional service and quality. If you think you've found the same specialty product offered at a lower delivered price, please email us at Support and say that you’d like to report a Price Match. We’ll ask you for the competing store’s name and the exact location of the advertised item to verify the price and that the item is new, in stock, the manufacturer’s warranty and specs. Once we’ve verified the competitor’s pricing, we will match the lower price, subtract 10% of the difference between prices, and process your order. If we offer a product for $1,000, and you find it for $900 somewhere else, you’ll pay $890 with our 110% Guaranteed Price Match. If you find a lower delivered price after you’ve purchased a specialty product from us, you’ll still reap the benefits. We will honor our 110% Guaranteed Price Match for up to 10 days after your purchase by giving you an in-store credit for 110% of the difference in price. 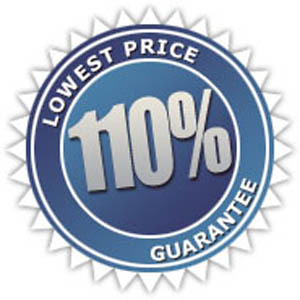 Our 110% Guaranteed Price Match is valid when the named competitor is an authorized dealer of the product and is selling a non-auction, new, in-stock, warranted item at or above the manufacturer's wholesale cost plus our standard order processing cost of 10%. Delivered price is calculated by adding the base item price plus shipping, handling, taxes and any other charges. This offer may not be used in combination with any other financing or promotional offers. Happy Trampolines reserves the right to refuse any order or price match if the preceding terms are not met or cannot be verified.